This is a Syrian recipe, adapted from my friend Laura who adapted it from her friend Matthew, who adapted it from a cookbook by Barry Vera. Such is the evolution of recipes. Feel free to adapt it further. You might prefer different spices, or more tahini. Tahini does not last forever – it goes rancid and stale – so don’t be tempted to use that half-eaten jar that’s been in the cupboard for six months… Serve this dish as a dip with warm flatbreads. Scrub the beetroot but do not peel. 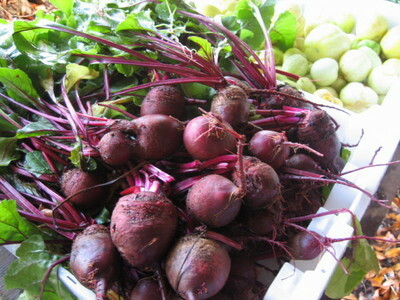 Boil in a pan of salted water until tender to the core, about two hours depending on the size of the beetroot. You may need to keep topping up the water. Drain and then rub the skins off using a cloth or kitchen paper. Let cool. Coarsely grate the beetroot into bowl, then mix in the yoghurt, tahini, garlic, cumin, chilli, vinegar, lemon zest and juice. Mince or julienne half the mint leaves and mix them in too. Season to taste, cover and refrigerate. To serve, bring to room temperature and garnish with the reserved mint leaves.